"The real battle is just getting started." "Tear through the shackles of convention with your silver fangs! I ride the Great Silver Wolf, Garmore!" The top of the Tatsunagi Financial Group, and the host of the Asia Circuit. Apparently has some involvement with the Foo Fighters. 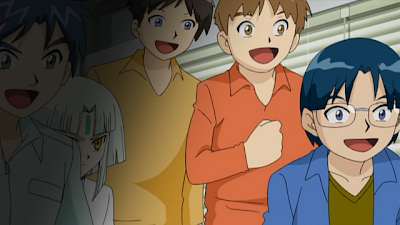 Takuto's appearance in season 1 is brief and barely alluded to, lasting only a matter of seconds in ride 57. During Ren's flashback Takuto can be glimpsed while Suzugamori recounts how he first became consumed by PSY Qualia. 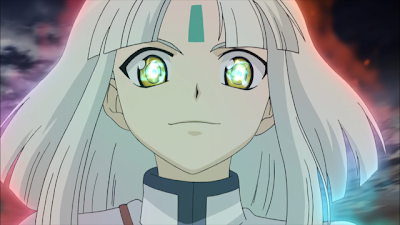 Previously Suiko had implied another party backing the Ultra-Rare idol group, having told Suzugamori of a "Him" that he should be grateful to for his power. Due to this implied connection with Ultra-Rare, as well as Takuto's strong financial backing through the Tatsunagi Group, it is currently believed that Takuto had originally scouted Ren in his card shop for PSY Qualia. This would explain where Ren gained the funding to hire Kashiwagi Construction to build the Foo Fighter HQ, and why its model of Motion Figure System is familiar to Kourin. Tatsunagi is a main character in season 2, the first ride of which deals with his meeting and first fight with Aichi. 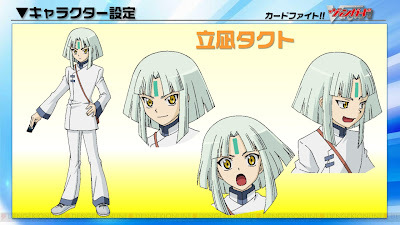 The Gold Paladin card, Incandescent Lion Blond Ezel, carries a definitive resemblance to Takuto's unique facial marking, as well as his hair and eye color. During Takuto's cardfights, other units normally free of these markings develop them as he rides them, ascending from Beaumains and into Garmore. Spoiler warning: Season 2 details follow. Tatsunagi begins the Asia Circuit arc by challenging Kai and Aichi to cardfights. Posing as a beginning player, he draws them in with his Gold Paladin cards before using Garmore's limit break and showing them a vision of the current Cray. Having witnessed the sealing of the Royal and Shadow Paladins, as well as the Kagerou clan, Tatsunagi then creates a pair of subtle altercations in the world's timeline. Following their fights, Kai's deck is replaced with a Narukami one, and Aichi's with a Gold Paladin deck. Aichi is the only character to recognize these changes. After this, the rest of Team Q4 has no memory of them ever using their previous clans. For all purposes, the world has collectively forgotten the Royal Paladins and Kagerou. Later, Tatsunagi announces the commencement of the Vanguard Fight Circuit on television, and issues an invitation to Team Q4, prompting them to enter the Circuit. Takuto keeps a close eye on all of the participating teams as the Singapore stage of the Circuit develops, up until the semifinals where Sendou Aichi and Christopher Lo clash. Appearing before the two of them in a vision of Cray while simultaneously shutting down outside access to the Singapore stage's arena, Takuto draws out Aichi's dormant PSY Qualia. Simultaneously he awakens Chris', and sits back to watch their fight unfold. Universal Notes: Takuto's surname contains the kanji for stand up (the tachi in tachigare; 立) and calm or lull (凪). Tatsunagi fights using a Gold Paladin deck, backed by powerful limit break skills which overwhelm his opponents. 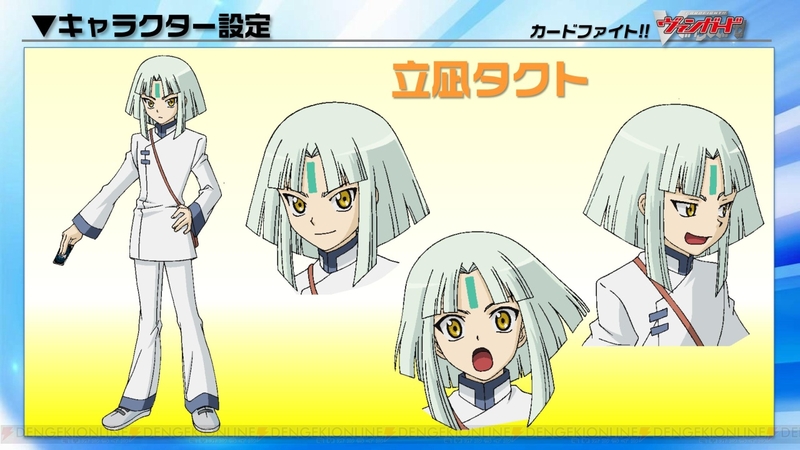 Takuto's cards are associated with superior calls and the use of highbeast units to support his knights. 1. "立凪タクト." Kero Kero Ace Vol. 52 May 26 Mar. Web. 23 Mar. 2012. <http://cf-vanguard.com/information/0326_kerokero/>.